We know the dilemma. You kids beg for mac and cheese while you plea for them to eat their veggies! Never fear, the solution is here. 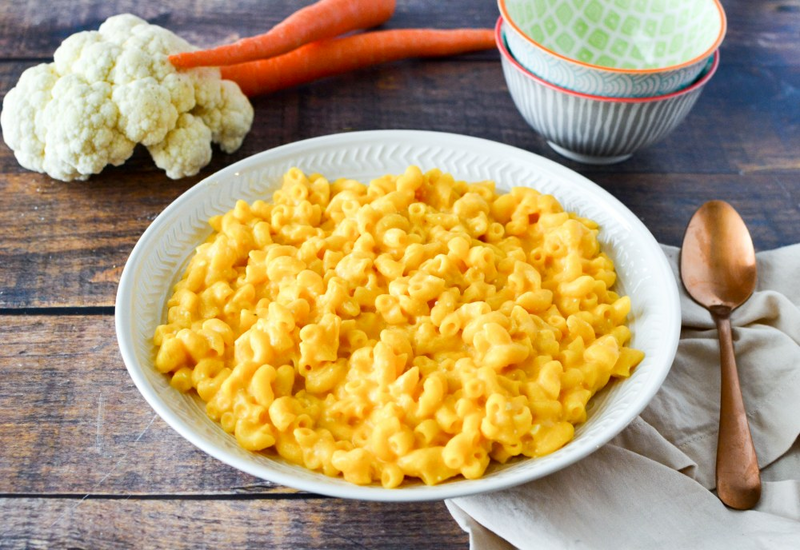 This vegetable macaroni and cheese is prepared with carrots, cauliflower, and butternut squash, as well as Cheddar and cream cheeses. It's so delicious, even the pickiest of eaters won't be able to tell there are veggies secretly hidden in the recipe. It's the perfect way to incorporate added nutrition to your weeknight meal. To cut down on prep time, look for pre-cut butternut squash in the refrigerated section of the produce aisle. Using an immersion blender makes this recipe a one-pot meal! Per Serving: 406 calories; 22g fat; 36.0g carbohydrates; 18g protein; 63mg cholesterol; 365mg sodium. I've been on a "hidden veggie" kick lately, and I absolutely loved this mac and cheese version. You can barely taste the butternut squash, carrot, and cauliflower. This is healthier and more nutritious than a traditional mac, and just as good. The cream cheese and Cheddar make it extra creamy and delicious! If you have kids you must try this recipe! Stay away from the boxed mac and cheese and feed them this delicious and nutritious mac and cheese recipe. It's the only way I can get my kids to eat their veggies with no complaints. The sauce is really good and you can't really tell that there's anything else in it. Use any kind of noodle, elbow or fusilli works great. This has a really good flavor! I sped up the process by using my MealPot to steam the veggies. You would never know there are so many veggies in here. The blend of the veggies and the cheese make a very flavorful sauce. The recipe is big, my husband ate it as a side with two helpings, I had it as my meal and I package up two containers, one for my mother and one for my son and an additional for left overs for our house. My wife and I enjoyed this recipe but both our girls wouldn’t eat it. They were super excited for Mac n cheese and had no idea what was in it but immediately asked what’s wrong with it. Since it’s supposed to be a hidden veggie recipe I expected it to pass the kid test. Since it didn’t I wanted to give it 3 stars but since it’s a good recipe I upped it to 4. It’s worth a try for sure. I would recommend adding more cheese, maybe even dusting it with bread crumbs and baking it in the oven. Good meal, served w meatballs. My kids and I agree that you could not taste the veggies, but all felt like it was a bit bland. Definitely had to add salt and pepper. I also substituted regular noodles for quinoa noodles.